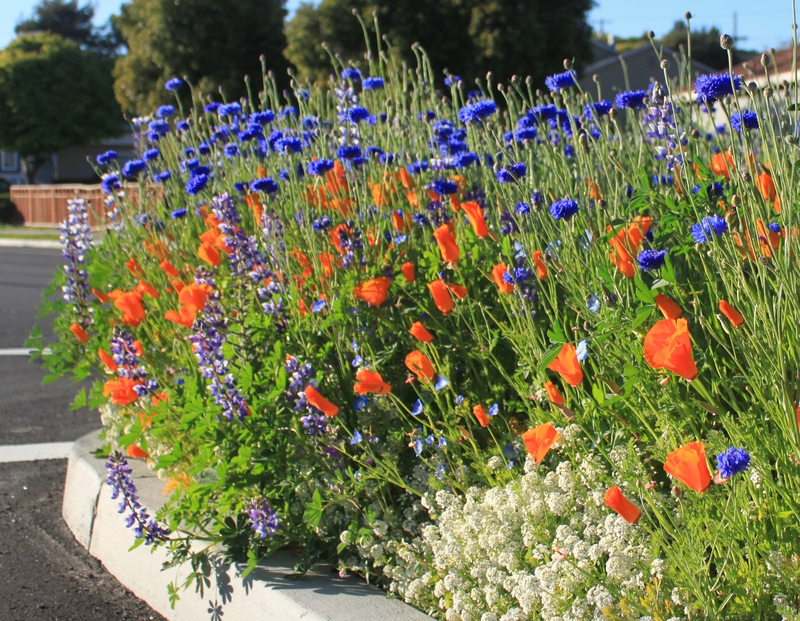 For the past few weeks, Anita and I have been enjoying a wildflower planting in the new medians on Carlson Ave near our house. 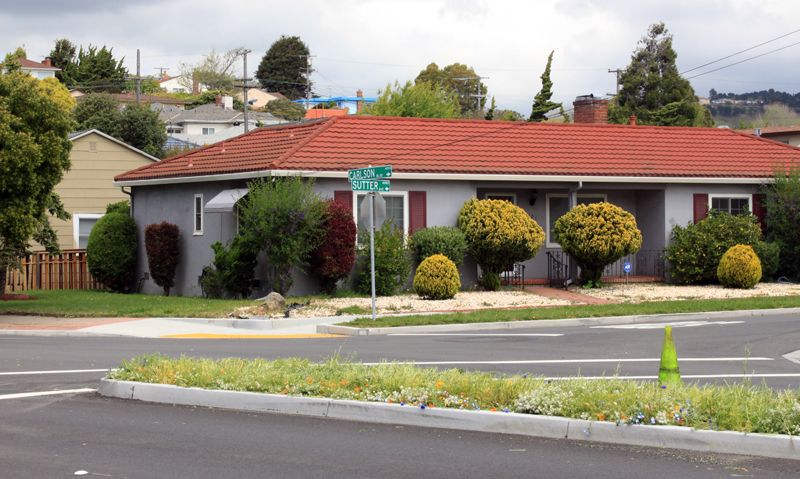 For years Carlson was an oddly humped road that had such a steep cross-slope near the sidewalk that the car door would hit the curb before it opened all the way and bicycling felt treacherous. To fix that, the city had to lower the street more than two feet to bring it down below the sidewalk, and in the process they also had to lower all of the utilities. The entire project took more than two years, involved all kinds of blocking of cross-streets and traffic, and was hugely inconvenient. 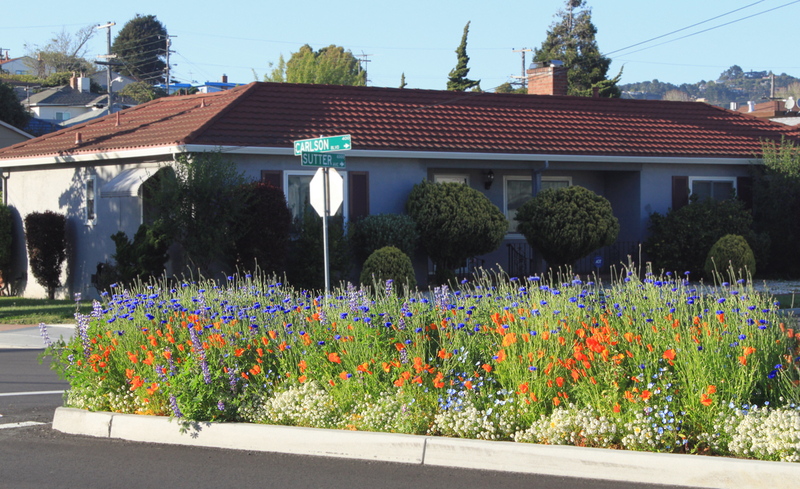 But all is now forgiven, as far as I’m concerned, because the city added a median to the street and filled it with twelve blocks worth of wildflowers, many of them native. I’m happy to have my roads blocked if it means I get to drive and bicycle past wildflowers. 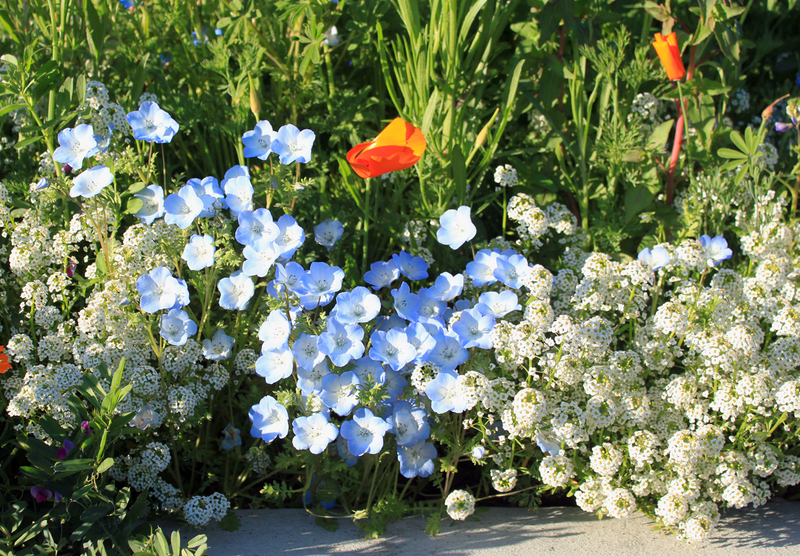 So far, I’ve seen California Poppies, Bachelor Buttons, Tidy Tips, Baby Blue Eyes, Alyssum, Lupine, and a few Snapdragons blooming, and there is a lot of Clarkia waiting for next month. Hmmm…. Be careful what you praise on the internet. The same day that I put this post up, the city weedwacked all of the wildflowers. I’m guessing the planting grew too tall and was blocking visibility, but the city might also be ready to plant trees now. Farewell (to Spring), Clarkia, we never saw you bloom. — Coda — Apparently an elderly driver got into an accident because of the reduced visibility caused by the wildflowers. Unfortunate for him, and for the wildflowers. 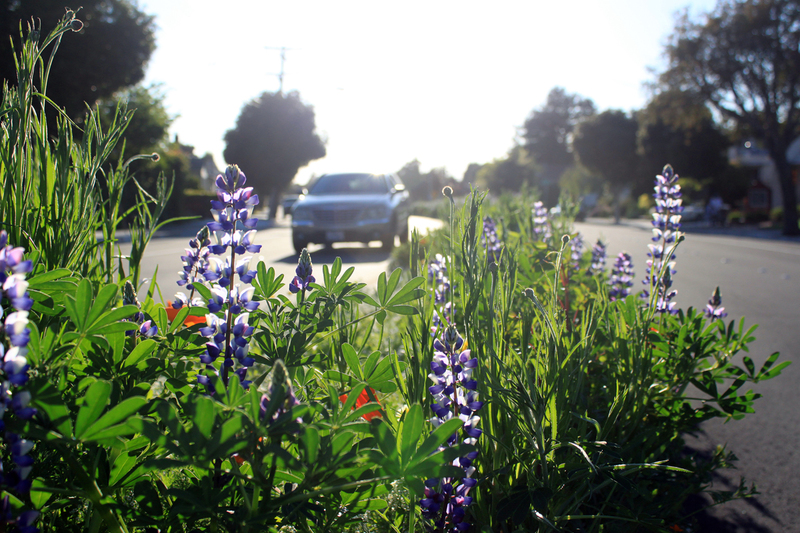 This entry was posted on Wednesday, April 25th, 2012 at 7:08 am and is filed under bay area, richmond, california, wildflowers. You can follow any responses to this entry through the RSS 2.0 feed. You can leave a response, or trackback from your own site. 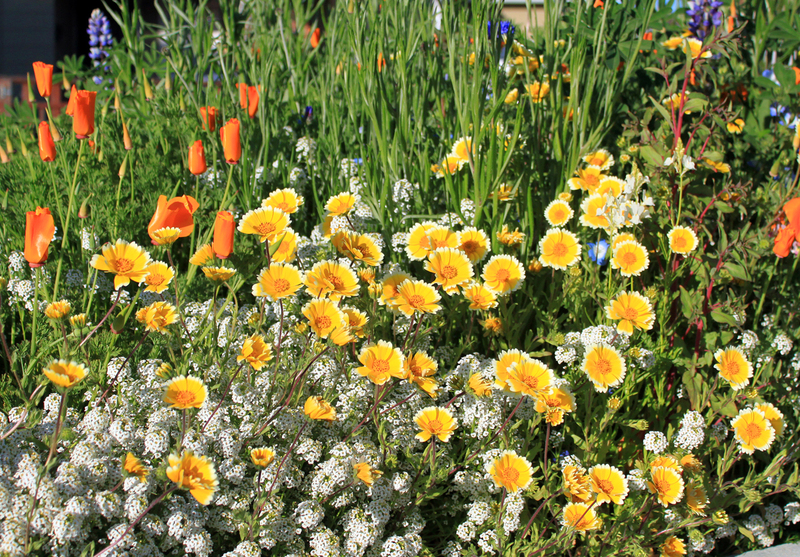 What a fabulous display of wild flowers. Yep. It was fun while it lasted. That was too good to last! Kind of amazing really.